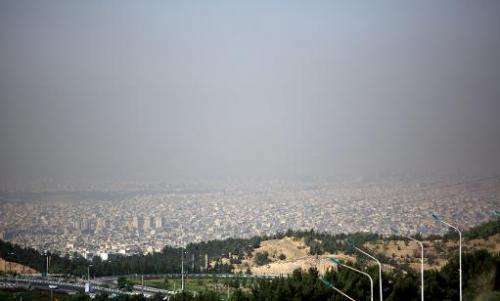 Air pollution has forced Iranian authorities to close elementary schools and kindergartens in Tehran province for three days from Sunday, the state broadcaster said. Schools had already been closed due to pollution on Sunday, while government agencies were to shorten working hours on Monday and Tuesday as pollution has reached alarming levels. Sunday's decision to extend the school closure for more two days was made by a crisis committee on air pollution, the broadcaster said. In addition, alternate-day driving restrictions had been imposed for private vehicles based on plate numbers, it said. A constant woe for the eight million residents of the Iranian capital, pollution is blamed on bumper-to-bumper traffic and factories in the vicinity of the city wedged between two mountains, thus trapping fumes. The poor air quality is also exacerbated by reliance on domestic production of petrol of a lower quality, and therefore more polluting, a byproduct of Western sanctions on Iran's fuel imports. Efforts by officials to boost public transport, including extending the metro and establishing lanes for buses only, have barely dented the problem because of the growing number of cars, many of which are old and inefficient. With four of its cities among the world's 10 most polluted, other parts of the country also struggle with pollution. In 2012, air pollution contributed to nearly 4,500 premature deaths in Tehran alone and nearly 80,000 across the country, according to figures by the health ministry. Dozens of people were hospitalised last week in the southwestern city of Ahvaz, and thousands rushed to get medical assistance as pollution levels reached dangerous levels. One of the most polluted cities in the world, Ahvaz is located in oil-rich southwestern province of Khuzestan.